This template targets iOS and Android phones and tablets in both portrait and landscape orientations. It uses the Dojo Mobile framework and includes the Dojo Heading widget. The meta tag properties viewport, apple-mobile-web-app-capable, and apple-mobile-web-app-status-bar-style contain several useful properties when building mobile friendly web applications. The compact build contains only the essential parts of the API and does not include the desktop focused widgets & layouts. It is a better choice as a starting point for mobile development. First, we need to require the Map, mobile, and supporting classes into our application. Then we use the mobile parser to create the widgets from markup. Calling the parser directly is preferable to using the parseOnLoad: true dojoConfig option, when using the mobile specific dijits. It is smaller than the default parser and tuned for loading the mobile dijits more quickly than the default parser. Finally, we ensure that the address bar is really hidden. The meta tags above alone aren't sufficient to hide the address bar on Android phones and the iPhone in portrait mode. The dojox.mobile utility function specifically handles various device differences and corner cases where a simple window.scrollTo call does not work. The map resize() and reposition() methods are useful for updating the size and position on the map. This tutorial uses Dojo's header widget. The header represents a navigation bar, which usually appears at the top of the viewport. 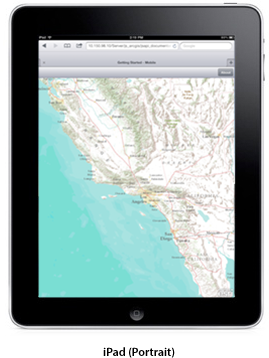 Therefore, we need to use a few additional properties to adjust the map size when the device's orientation changes. We can use the has functions to determine the device's OS and device category. Either window.matchMedia or mobile.getScreenSize can be used to determine the device's current orientation (landscape or portrait). For this example, we use the mobile.getScreenSize technique. 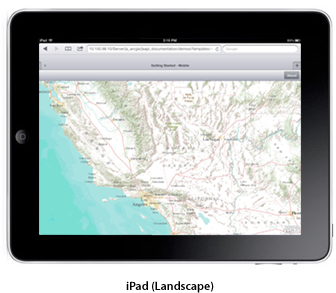 The height of the header bar and any of the browser's own visible components are subtracted from the map size, such that the map always exactly fills the available space regardless of device or orientation. Special care and extra adjustments are required for iPhones. These adjustments are separated out into the iphoneAdjustment function. This function adjusts for the delayed address bar hiding and the ever-present bottom buttonbar in portrait mode. It also sets up additional single use event listeners to handle the true fullscreen toggling in landscape mode. Please refer to Apple's documentation for exact dimension of UI components. In iOS, screen.availHeight gives the total edge to edge measurement of the screen, whereas, window.innerHeight gives the dimensions available in between the browser's native UI components. Therefore, screen.availHeight - window.innerHeight gives the height of the visible native browser UI. The map is created the same way regardless of the platform being targeted. To ensure that the map is properly sized when returning from any other "views", we also resize the map after transitioning back to the map. You can view this application on your mobile device or WebKit browser (Chrome or Safari) here. The source code for this sample can be found here.